Our specialty automotive racks offer a complete solution for storing car and truck parts such as fenders, tires, bumpers, mufflers, batteries, molding, sheet metal, hoods, and much more. They’re more than just storage racks; they’re a complete system that stores and organizes all of your parts for a more efficient parts department. What makes the specialty automotive racks unique is their ability to adapt to your work environment and are built with flexibility in mind to change with your needs. Included are racks for bumpers and pipes, sheet metal, batteries and tires, and more. Numerous standard dimensions and sizes are available, along with a wide variety of accessories that allow you to create a customized layout without the customized price. The steel framework also allows a wide range of accessories and components to be easily added. The racks come in starter units and are easily expanded with additional add-on units. 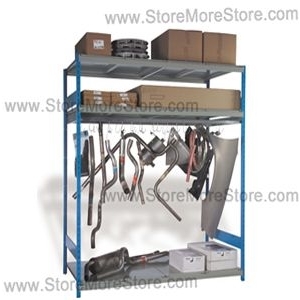 We have many other unique automotive storage solutions that are perfect for your parts department, such as modular cabinets, heavy-duty industrial cabinets, and more. 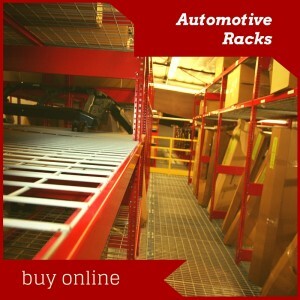 All specialty automotive racks are available for purchase online at StoreMoreStore. Do-it-yourself instructions are included with the automotive racks, so no professional installers are needed. We are also happy to help you decide which automotive racks would work best for you and your specific automotive storage application. Call us at 1-855-786-7667.